This article is sponsored content brought to you by Boehringer Ingelheim. 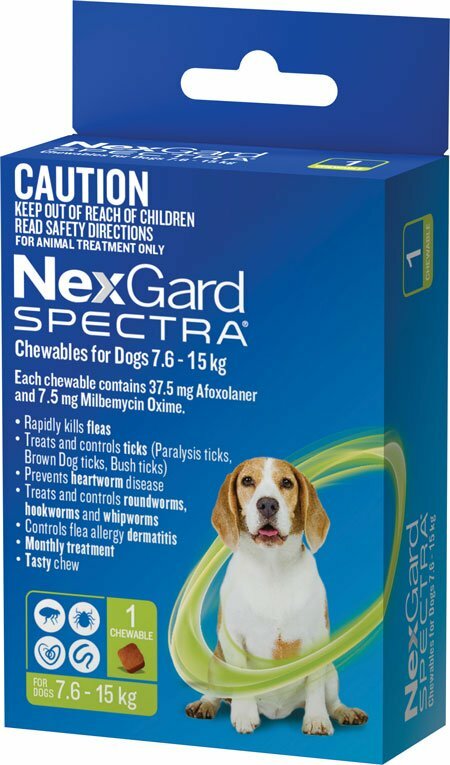 NexGard Spectra, an endectocide containing afoxolaner (an isoxazoline) and milbemycin oxime (a macrocyclic lactone), was registered in 2017 to provide broad-spectrum protection against fleas, ticks (including paralysis ticks), heartworm, and gastrointestinal nematodes (roundworms, hookworms and whipworm). For the treatment and prevention of flea infestations, control of ticks and mites, prevention of heartworm, and treatment and control of intestinal worms in dogs and puppies from eight weeks of age. NexGard Spectra rapidly kills adult fleas and is indicated for the treatment and prevention of flea (Ctenocephalides spp.) infestations, for the control of newly acquired adult fleas and for the control of flea allergy dermatitis. Following administration, fleas are killed within 6-8 hours. Rapid onset of action kills newly acquired fleas before they can lay eggs. Fleas can transmit flea tapeworm (Dipylidium caninum). Effective flea control with NexGard Spectra prevents flea tapeworm infestation in dogs. NexGard Spectra treats and controls paralysis ticks (Ixodes holocyclus), brown dog ticks (Rhipicephalus sanguineus) and bush ticks (Haemaphysalis longicornis) for one month. It provides effective control of pre-existing paralysis tick infestations within 24 hours. Ixodes holocyclus ticks do not occur in WA. In tick season, daily searching for, and removal of, any ticks found is recommended. NexGard Spectra treats and controls demodectic mange caused by Demodex spp., sarcoptic mange caused by Sarcoptes scabiei and ear mite infestations. NexGard Spectra prevents heartworm disease caused by Dirofilaria immitis and treats and controls roundworms (Toxocara canis and Toxascaris leonina), hookworms (Ancylostoma caninum and A. ceylanicum) and whipworms (Trichuris vulpis). 1. Beugnet, F., et al (2016) Efficacy of afoxolaner in a clinical field study in dogs naturally infested with Sarcoptes scabiei. Parasite, 23, 26. 2. Carithers, D., et al (2016) Assessment of afoxolaner efficacy against Otodectes cynotis infestations of dogs. Parasit Vectors, 9(1), 635. 3. Lebon, W., et al (2018) Efficacy of two formulations of afoxolaner (NexGard® and NexGard Spectra®) for the treatment of generalised demodicosis in dogs, in veterinary dermatology referral centers in Europe. Parasit Vectors, 11(1), 506. 4. Beugnet, F., et al (2017) Preventive efficacy of NexGard Spectra® against Dipylidium caninum infection in dogs using a natural flea infestation model. Parasite, 24, 16. 5. Beugnet, F., et al (2015) Comparative speed of efficacy against Ctenocephalides felis of two oral treatments for dogs containing either afoxolaner or fluralaner. Vet Parasitol, 207(3-4), 297-301. 6. Tielemans, E., et al (2017) Efficacy of afoxolaner plus milbemycin oxime chewable tablets (NexGard Spectra®, Merial) against adult Ancylostoma ceylanicum hookworm, in dogs. Vet Parasitol, 238, 87-89. 7. Tropical Council for Companion Animal Parasites (2018) Guidelines for the diagnosis, treatment and control of canine endoparasites in the tropics. 1st Edition. Foot-and-mouth disease—do you know the signs?